Long time no see. I figured I had to pull out a real show-stopper to get back into your life. Enter Green Bean Casserole! Before the recipe though, a word of welcome to my new website, IsaChandra.com! It was a fabulous 15 year run, but as you might have noticed, I hadn’t updated The Post Punk Kitchen in years. I just needed something fresh and new. So it’s basically like I cut my bangs and feel like a new person. Only in internet form. But don’t worry, all of your favorite recipes are being transferred here (if they haven’t been already) and I’ll be updating way more often. 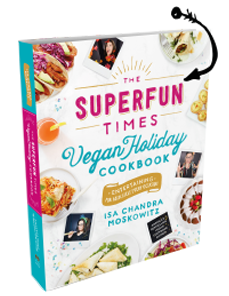 Starting with some recipes from my new cookbook, The Superfun Times Vegan Holiday Cookbook! Order it, like, right away. Now on to the recipe. Did your childhood Thanksgiving come out of cans and boxes? And do you kinda sorta maybe just-a-little-wittle-bit miss it? Then this casserole is right up your alley! This version has a few real ingredients, but don’t let that fool you, it’s still as embarrassingly good as its predecessor. ~ Lots of fried onion brands are vegan, or you can just google how to make ’em yourself. Whole Foods carries a nice vegan one, for sure. Preheat the oven to 375°F. Lightly grease a 9-by-13-inch casserole dish. Combine the cashews, broth, flour, and nutritional yeast in a blender. Puree until completely smooth; this can take up to 5 minutes depending on the strength of your machine. Periodically stop the machine to prevent it from overheating, and scrape down the sides of the blender jar with a rubber spatula make sure you get everything. Meanwhile, heat a large sauté pan over medium-high heat. Heat the olive oil, then sauté the green beans and onion with a pinch of salt until the green beans are softened, about 5 minutes. Add the mushrooms and sauté 7 to 10 minutes more. The mushrooms should have released most of their moisture. Add the blender mixture to the pan, along with the onion powder, remaining 1 teaspoon salt, and a few grinds of black pepper. Cook, stirring often, until thickened, about 10 minutes. Add half of the fried onions. Transfer the green bean mixture to the casserole and top with the remaining fried onions. Bake until browned and bubbly, 22 to 25 minutes. Let cool for a few minutes before serving. Looks awesome! Can I beg for a Pin It button? I’ll be making this soon enough! Green bean casserole was always my favorite growing up. I’m beyond excited for your new book and your new website 🙂 Welcome back. Looks amazing, can’t wait to see the site in days to come. Keep up the good work! I’m excited to give this a try for Thanksgiving! I ordered the new book and can’t wait to get it. Your recipes are the best! The new site looks amazing, Isa! So exciting to have you back (in internet form). This is kind of a random question, but are PPK t-shirts gone forever? The design is so good and I deeply regret not buying one when I had the chance. If you did a limited run, I bet they’d sell out – especially now that they have retro cachet, haha. Can you leave out the mushrooms? Would you need to modify the recipe if you do? Was going to ask the same question! Not a fan of mushrooms. Also hoping for an alternative to mushrooms?… I often wonder what a good replacement is for them in many recipes. Thanks! Yay, new cookbook!! And a recipe for my favorite part of Thanksgiving! Question on this one: Can I pause before the last step, so that I can prep at home then top w/ the fried onions and bake? Or will that mess up the consistency of the “cream” sauce? Looks delicious. Very excited about the new site. You’re back!! It’s been so long! So happy to see this recipe! I have been a longtime follower and supporter, have all of your cookbooks, but still love to go to your website for updates. Thanks for all of your creativity! My daughters and I will be making Zomberoni Pizzas tomorrow and we are so excited about it! Great to see you’re back Isa! I love your recipes. Can’t wait to try this one. Thank you. Love the site, Isa! This recipe looks fun. Green bean casserole was one of my favorite things when I was a kid. Ugh . . . is this one better than the original one she posted? I came here looking for the old one (found it around page 12 of the recipes) but now I’m not sure which to make. Anyone made both and can help me out? I know this is way past Thanksgiving, but just wanted to say that this is the best green bean casserole ever! I like this one better than Isa’s first one and it’s 200% better than the traditional commercial cream of mushroom soup version, which I could never get excited about. I get excited about this one! And it was raved about by a green bean casserole fanatic at my office Christmas party last month. This looks fabulously delicious!! Would simply using gluten free flour in place of AP flour work to make this gluten free? Also, are there any fried onion brands on the market that are non-GMO/ organic? Thanks so much for this recipe! Delicious! While I was cooking the mushrooms, I added a dash of soy sauce to enhance the umami profile of the dish and complement the mushrooms. I also added white miso paste to the “cream” because I find it has a taste profile similar to that of cheese–although more intense–and adds another umami kick to the dish. Welcome back Isa! This was really good – I think you could just make the sauce and mushrooms and have a version of Campbell’s condensed cream of mushroom soup – to use as a base to veganize old recipes. I will also be trying it for a base for cream soups. Can I use canned beans? Made this for a meat heavy friendsgiving and everyone raved about it without knowing it was vegan! Thank you so much!! The sauce itself was divine and will definitely use in other recipes. This recipe is different than the original one from the PPK website, is it possible to post the original one? I have made it several times before and loved it! How many people does it serve? I’m thinking I can make most of it the day before and then bring it to room temp, add the fried onions, and heat? I just made it the day before and plan to top it with the fried onions tomorrow and heat in the oven; I don’t even bother bringing to room temperature first (though I pull it out a little ahead to not stress the pyrex). I just put mine together and I added a little more green beans (28 oz) and there was still plenty of sauce – it filled a 9 x 13 pan completely. How many that serves will depend on other sides and appetites, but look at that casserole size and that’s the volume you’ll get! Made this today and it was fabulous, thank you Isa for making my childhood memories become bigger, leaner, more delicious vegan versions! I adore you for all things Holiday! The sauce is a mild yellow color because of the vegetable broth (even without the nutritional yeast) so keep in mind that it may look cheesy to omnivores, but it’s not! Amount of sauce is really generous, I found I was able to add even more green beans than called for. Generous sauce? Isa? Who would have thought 😉 Comfort food at it’s best, thanks Isa! This was UH-MAZE-ING. I’ve never had BAD green bean casserole but this recipe is off the charts. I actually had a moment of doubt smelling the nooch in the sauce (I like nooch — just wasn’t sure how it would taste here). Silly me. This is my go-to recipe now. (I’m watching my husband eat a red velvet cupcake from your cupcake cookbook. It’s a very Isa Thanksgiving!) Glad you’re back. I made this for Thanksgiving and I used 2 12 oz bags of frozen green beans (thawed of course) in place of the fresh. I just added them when I added the blender mixture. I also used earth balance instead of oil. I really doubt anyone would be able to tell this wasn’t traditional, dairy filled green bean casserole. It will be one of my go to Thanksgiving recipes for many years to come! Made this for a Thanksgiving filled with omnis, and they LOVED it! Flabbergasted that it didn’t contain dairy! This was so delicious!! Thank you, Isa! My copy of the new book is waiting for me at my local feminist bookstore – thanks to you and your publishers (?) for making it so easy to buy the book local online. This is AMAZING. Our dinner guests, vegan and non-, all thought so, too. Thank you for sharing your fantastic recipe! I am just getting around to making my notes from Thanksgiving dinner. It was pretty much an all-Isa dinner this year, and everything was amazing- including this green bean casserole. Even the non-vegans loved this one. I will definitely be making this again next year. Thanks, Isa! Made this the other day and despite the fact I accidentally burnt some of the filling over the stove it turned out INCREDIBLE!! 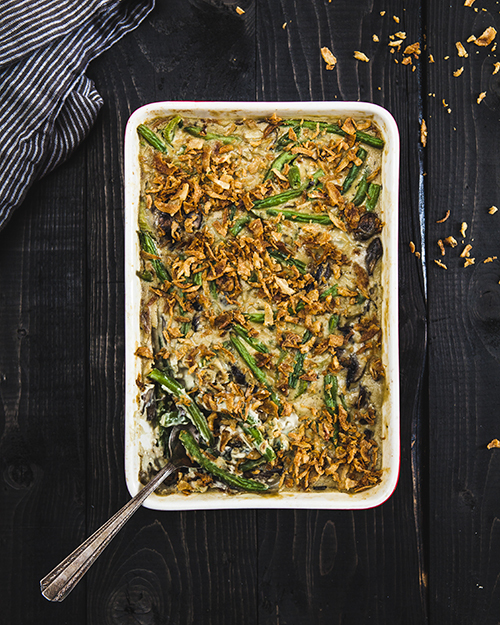 I’ve never actually had green bean casserole before but my friends who have said it tasted very close to the “real” thing – but better 😉 Thanks Isa for posting this amazing recipe! Also if there was a way to rate this recipe I’d give it 5/5 stars!!! I got the Green bean casserole, and mushroom gravy recipe out of your cookbook, which is awesome. Non vegans loved both at thanksgiving. This is the best green bean casserole. Thanks for the great recipe. Can I make this ahead of time and reheat? Isa, I’m glad you’re back! Veganomicon is what helped me GO Vegan, and no matter whose recipes I try, when I want something GUARANTEED delicious, I always come back to the Master. Question: my son is allergic to nuts, what can I use to replace the cashews in this recipe? Hi, A great and new dish from the familiar ingredients. Most importantly, you teach very detailed and easy to understand. Thanks a lot. I will cook for my family.! I made it!!!! Everyone loved it. Thank you… Isa does it again! Will it work if I replace the soaked cashews with soaked pumpkin seeds? There’s nothing healthier and tastier than green bean! I am also looking for a lawn service near me, do you know anyone I can talk to? Good link for the online game page free mahjong dimensions it is true be a great version. I was doing this dish for my colleagues from https://persuasivepapers.com/ and they were fascinated about it. Very tasty and easy to cook! This looks amazing! What is that lovely spread you are putting on it? this is very informative and intersting for those that want blogging field. It’s amazing, I’m glad I read it. Super news. Can you make the casserole the night before and serve the following day? Is the nutritional yeast optional or do u recommend adding it? This was amazing! My family had no idea it was vegan when I made it last year for Thanksgiving. I will be making this again this year plus a few other things from my copy of your Holiday’s cookbook, Isa. Thanks for putting so much thought into all your recipes. It really shows. Can this be made in advance? This recipe is AMAZING. I’m not a huge mushroom fan, but I just chopped them up to be super small and that worked very well. Many of my guests said this was better than any other green bean casserole they’d had before. Thanks for the recipe! Five stars! Amazing recipe. A sweet breakfast! Looks wonderful, will make it soon! Would love to have a pin-button though…. looking forward for much more recipes, thnx Isa! A really nice idea for breakfast! See what mobile responsive net layout seems like. … Working with KO Websites, Inc., this Bay Area transferring organization launched its new cell … A neighborhood Bay Area B2B business carrier agency explains. Wedding one of the most important ceremonies for each and every person, in fact, it will be the most memorable Continue ReadingTop 10 Destinations wedding Places around the World. Are you planning to upgrade your system with the latest windows 7 home premium? If so, you should consider few important aspects. Melissa Sue Anderson is an American-Canadian actress. She began her career as a child actress after appearing in several commercials in Los Angeles. For our subscribers now we chosen one of the favorite Journalists in America that are seeking the Fox News along & Continue ReadingLisa Boothe Age Height Pictures.